Although produce from the garden is limited at the moment, I still wanted to make sure that we have access to the abundance of summer when the winter comes around. Next year I hope to have a good tomato harvest, but I expect this year’s to be small, late and only enough for immediate use. I had heard about a seller of fruit and veg who visits a nearby town once a week and who has good quality produce to buy in bulk, so this morning at 7:15 I set off to investigate. 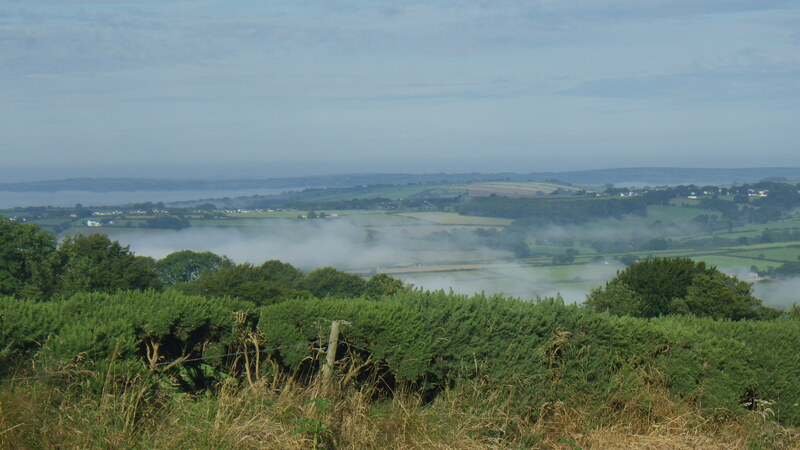 I had been warned to get there early – ideally between 7:30 and 8 – and the advice was good. Even just after 7:30, when the sun was struggling to be seen through the morning mist, the place was busy. Other stall-holders were just setting up, but the fruit and veg man (and half a dozen staff) were doing a good trade. 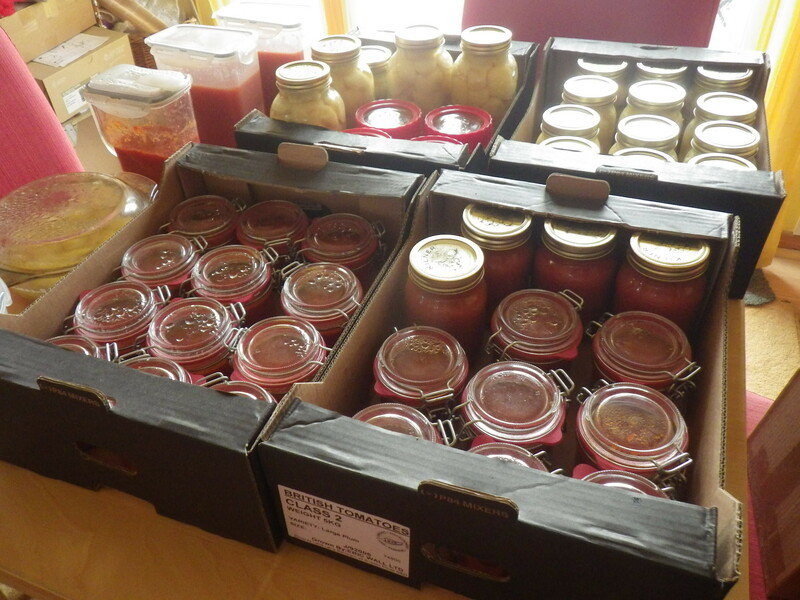 I had gone specifically to buy peaches and tomatoes for bottling, having been so successful with both these in the past. 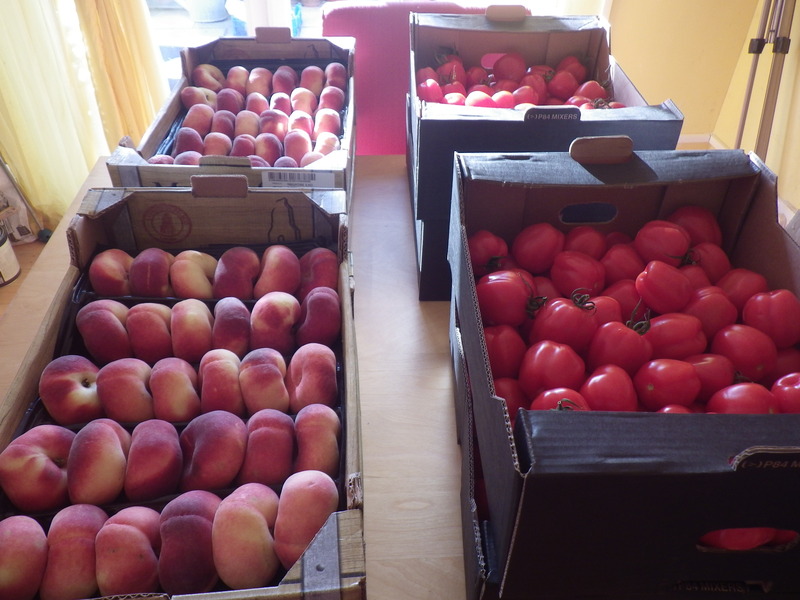 And, much to my delight, there were trays of flat peaches and of plum tomatoes – I was even given a peach to taste and, my word, it was fabulous. So I bit the bullet (like the peach) and bought four trays of each. Yesterday was a busy day – volunteering at Denmark Farm (moving piles of bracken onto the compost heaps, clearing out culverts and subduing a rampant silvanberry) as a well as a couple of blog posts, plus celebrating the 50th birthday of Doctor Who in the evening. Today, therefore, has to be much more relaxed. 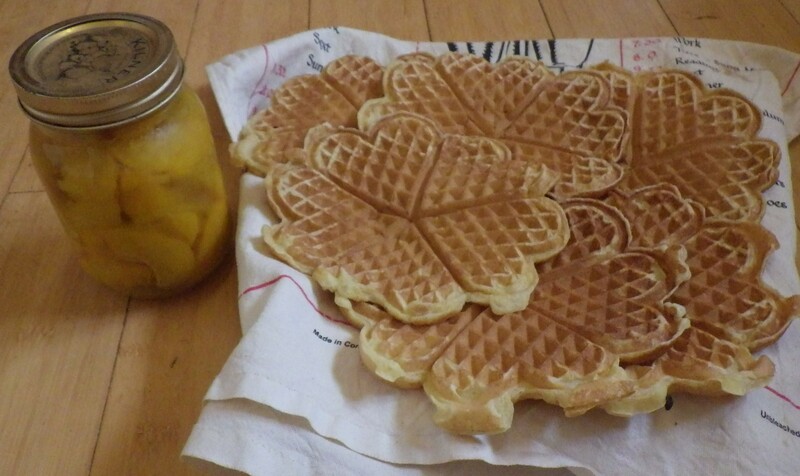 We started the morning with homemade waffles and some peaches from the batch that I bottled in the summer… what a delicious treat, it really was like having a little bit of stored sunshine, as I had hoped. This was followed by some virtual house hunting… my sister is planning to move house (much nearer to us – hurrah!) and so we spent a long time on the phone and online looking at possible houses. The rest of the day will be spent on creativity… Mr Snail-of-happiness has been coveting my fingerless mittens for a while now (they are brilliant to wear if using the computer when the house is a bit chilly) so I offerred to make him some (and thus to delay starting an amigurumi dragon that I spotted on The Guy Who Crochets blog). 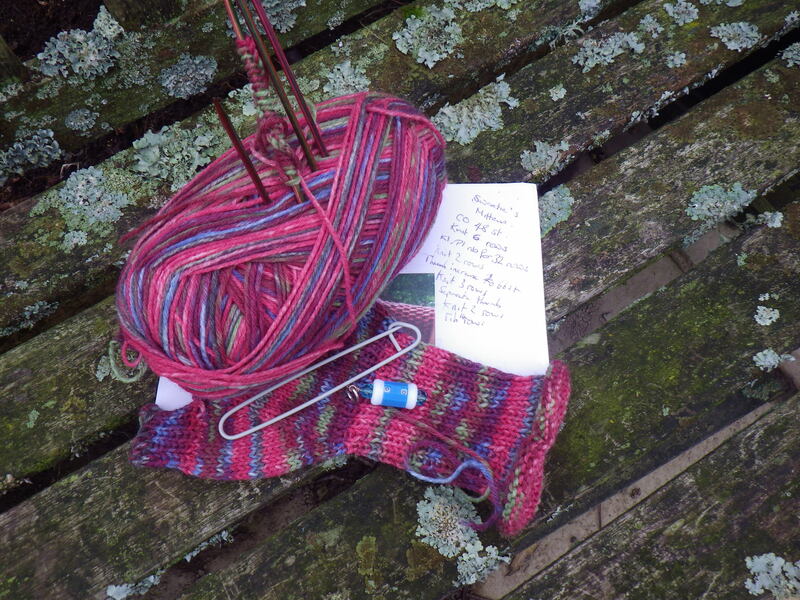 The only pattern I have for fingerless mittens fits me, so I’m writing a man-sized version as I go along. Right now the first one is done all except weaving in the ends and I hope to make the second today… so it won’t really be a lazy Sunday after all, just a relaxing one!